Some months ago, I wrote about my reaction upon reading Everybody’s Got Something by Robin Roberts. (In case you missed it, you can click here to read it). 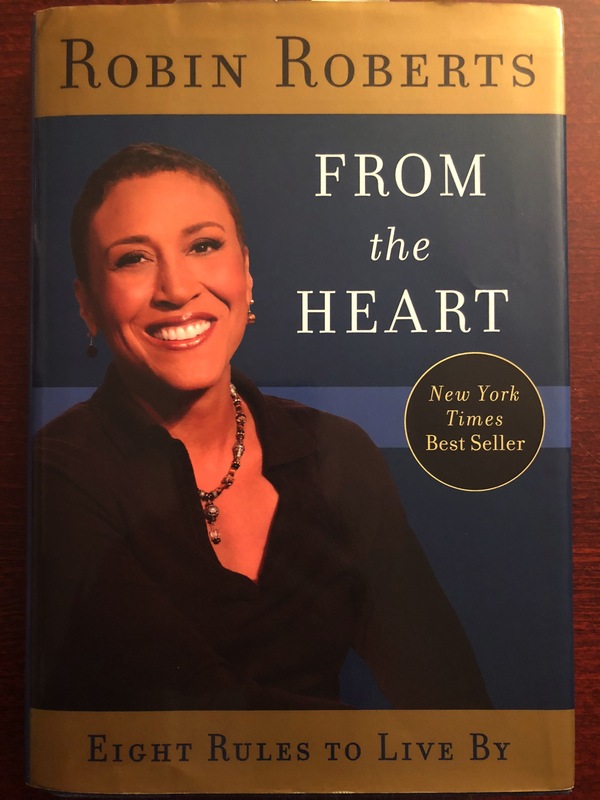 After reading my blog post, a good friend of mine let me borrow her copy of From the Heart – Eight Rules to Live By, also by Robin Roberts. — “Fear is what keeps people in the comfort zone … There is no comfort zone. Life comes at us in ways we can’t predict or control.” Oh, how very, very true. — “You can have sorrowful grief or you can have happy grief.” “… the idea that you can choose the kind of grief you have.” That was huge for me. I had to stop reading and think about that one, because up until then, I had always thought grief was grief. This last one is hard for me. It’s hard for me not to put myself down when the pain is intense, when something relatively simple like grocery shopping is difficult, when I’m out taking a walk with my husband, and I’m looking ahead trying to find a bench so I can rest. But I’m trying. I’m trying to remember to tell myself that just because my legs hurt doesn’t mean I’m weak. It doesn’t mean I’m less than I was before I became ill. It just means my legs hurt. Big smile. Warm hugs. Thank you. I am inspired by your reflections. Thank you so much, Janet!